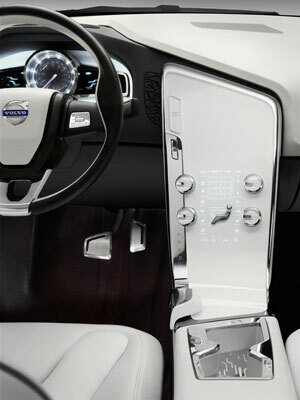 Here are more images and details of the Volvo XC60 Concept, set to be unveiled at the upcoming North American International Auto Show. 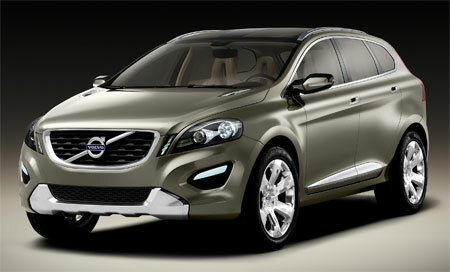 The Volvo XC60 Concept kills two birds with one stone, for one, it showcases to us the next Volvo XC model, younger brother to the big Volvo XC90. 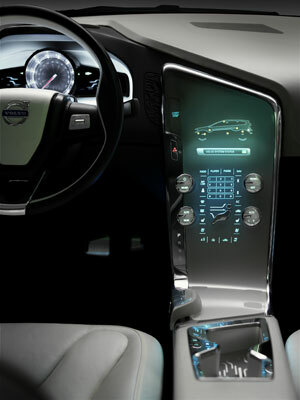 It also reveals several design elements that will be part of future Volvos. More details after the jump. â€œIn recent years we have successfully emphasized the Scandinavian characteristics that base prestige on timeless, functional elegance. 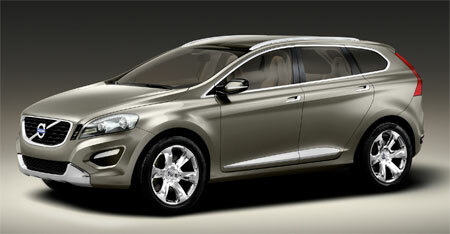 Now were elevating our design DNA to an entirely new level by litreally pumping up our cars visual volume. With more expressive, emotive shapes, it will be a magnet for the viewers eyes. 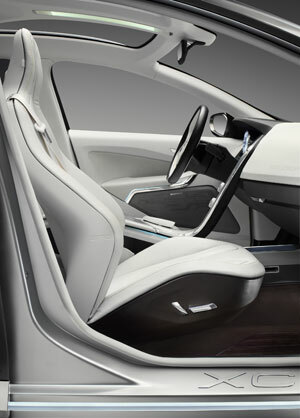 If a Volvo is recognizable from 100 feet away today, I want to get to the point where you will instantly spot it from twice that distance in the future,â€ says Steve Mattin, Design Director of Volvo Cars – so if you have a problem with the front of the whole Volvo range looking alike, you know who to look for! 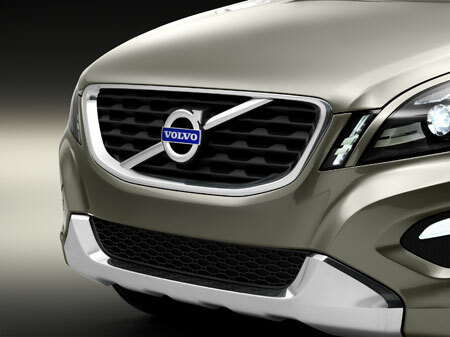 And yes, the Volvo design elements are there – you have the Volvo iron mark on the slightly trapezoildal grille on the front, but these are flanked with much more dynamic angled lights that will be part of Volvo’s new design language. 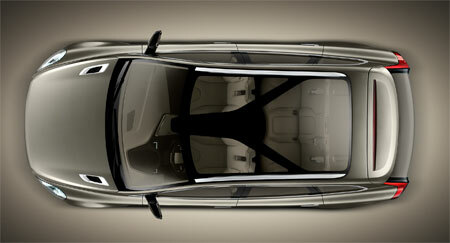 On the rear, you can see some hints of Volvo’s latest car, the Volvo C30 hatchback. 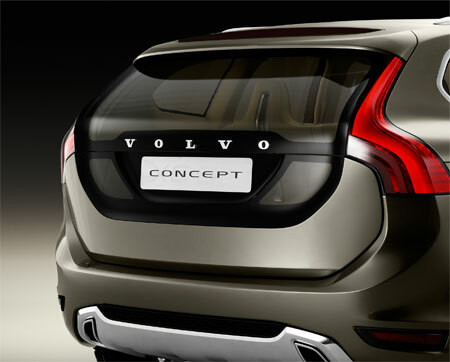 The tail lamp designs highlight the muscular shoulders, plus the tailgate is remininscent of the large glass tailgate on the C30 that many have criticized to be similiar to a hearse, but I suppose it will be due time when everyone accepts the functionality of the unique design. The lower part of the tailgate is a dark panel. 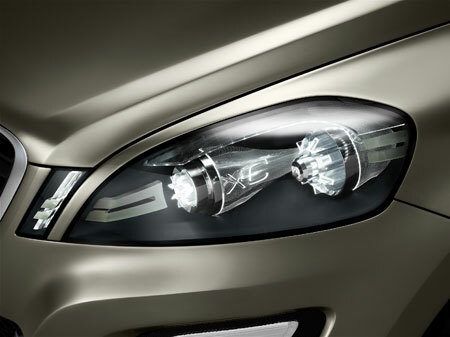 Viewed from inside, it becomes transparent to improve the drivers ability to see the area behind the car. The roof is also transparent from the inside, with dark-tinted glass attached on top of a Y-shaped bearing structure, creating a huge sunroof, enhancing the feel of spaciousness. While from the previous set of photos released most thought that gear shifting was done through a touch sensitive panel, it’s apparently not! 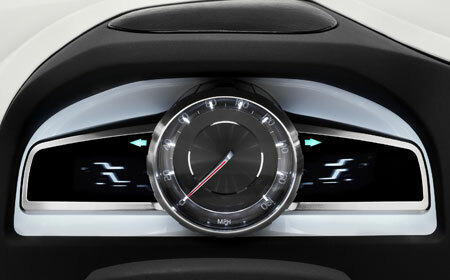 Instead, below the gear indicators you will find a slider, you slide the slider to shift the gear positions, and the status will be displayed on the area that everyone previously thought were touch sensitive buttons. 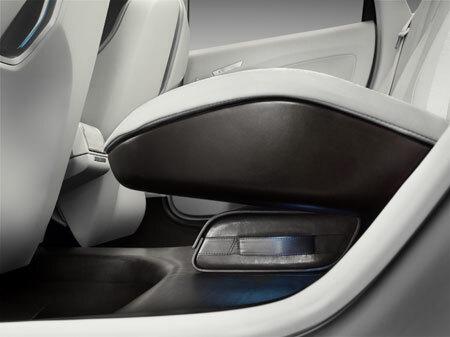 The center console surface is obviously iPod inspired, almost like a floating smooth wall of snow, which lights up with a surreal look when activated. Let’s move on to the engine. 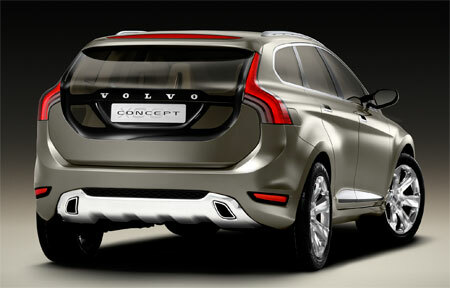 Underneath the hood of this Volvo XC60 Concept is a six-cylinder, 3.2-litre bio ethanol engine with an all wheel drive gearbox, providing 265 horsepower and 340Nm of torque for you to toy around with. Previously, Volvo had bio ethanol, or Flexi Fuel engines, in 4-cylinder form – this is the first Flexi Fuel 6-pot from Volvo, which first debuted in the Volvo S80 sedan. The engine has been optimized for E85, which consists of 85 percent bio ethanol and 15 percent gasoline, resulting in a 12.3 litres per 100km fuel economy, considered respectable considering bio ethanol contains 40% lower energy density compared to normal gasoline. Flexi fuel is also more environmentally friendly, as emissions of fossil carbon dioxide drop by up to 80 percent when driving on E85 bio ethanol. 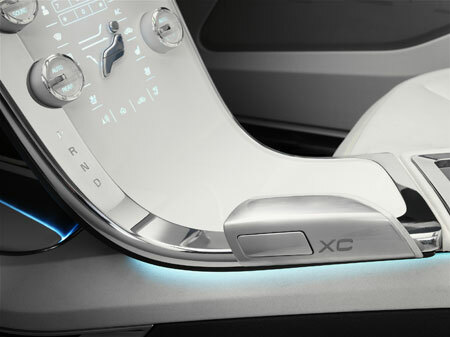 The Volvo XC60 Concept will also showcase a new safety technology developed by Volvo called the new City Safety technology which activates at speeds at up to 30km/h, which senses when a collision is likely to occur and pre-charges the brakes to assist the driver in avoiding an accident. If the relative speed difference between the two vehicles is below 15 km/h, the system can help the driver avoid the collision entirely. 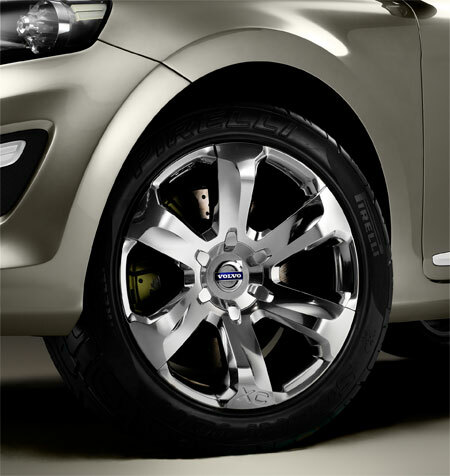 Between 15km/h and 30km/h, the system attempts to reduce the Volvo’s speed as much as possible before the impact. 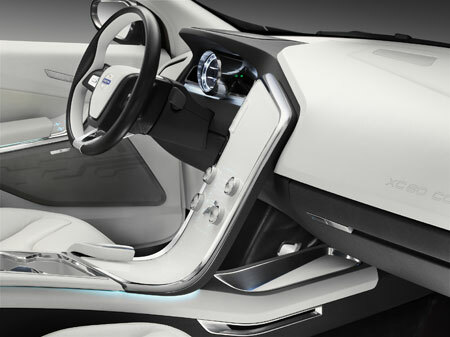 Fredrik Arp, President and CEO of Volvo Cars says the XC60 Concept offers a good indication of how the â€œrealâ€ XC60 will look. 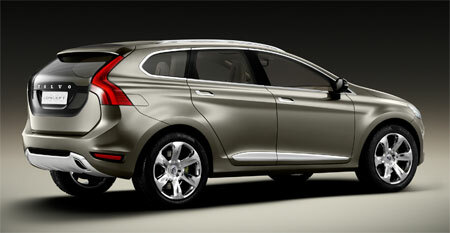 The Volvo XC60 will arrive right on time to challenge it’s competitors in one of the most fast growing segments in recent years, the small premium SUV segment.